The Dutch built about 34 forts in Java including those on the islands of Nusa Kambangan and Madura. The Dutch built a number of forts as part of an overall system and resources as well as their political enemies. One of East Java forts is Fort Sumenep built during 18 th century. 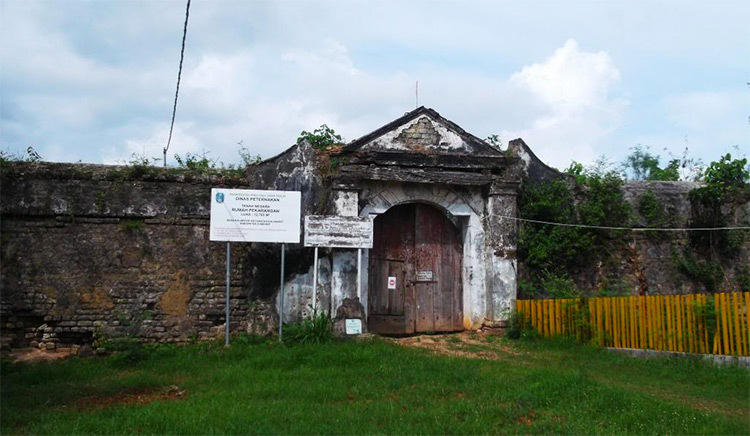 This Dutch fort is situated in Kalimo'ok village, Sumenep regency, on the southeast side of Madura about 200 meters north of Marengan river. It is located quiet far from the Kalianget Port as well as the city center, about 3 km from the coast and 7 km from Sumenep palace. This fort was built in 1785 and had a square ground plan with 2500 m2 in large, 150 m in length, 100 m in width and four bastions. At that time, this fort was also equipped with four cannons and housed 25 to 30 European soldiers under the command of a lieutenant. An English source mentioned that in 1811 fort Sumenep was in bad shape, its location was badly chosen, so that in fact it was only use as a depot. Fort Sumenep was built of bricks and has a square ground plan with two entrances, one on the north side and the other on the south side. On each corner is a bastion. The walls are 5 m thick. One bastion is connected each other with 5 m width of rampart. The surviving segment of the fort include its surrounding wall, two gateways, a jail house and a magazine in the interior. ow, this fort is converted into a holding ground of the Small Animal Husbandry Development Project. With its new function, on the inside as well as outside of the fort a number of buildings for animal stables and guard houses have been built. Outside the fort, on the west side is Dutch cemetery dating from 1933.